Welcome to Two Guns, Arizona, Kathy Weiser-Alexander, February, 2015. Click for prints & products. 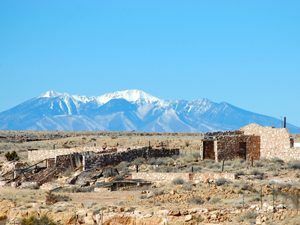 About thirty miles east of Flagstaff, Arizona, is the historic ghost town of Two Guns. The area that would become Two Guns started as a site of major confrontation between the Navajo and the Apache in the 19th century. 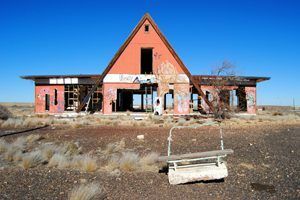 In 1880, just to the north of Two Guns was a railroad town called Canyon Diablo, which would become a ghost town before Two Guns was even born. Reportedly, Miller was an eccentric hermit who lived in a cave in nearby Canyon Diablo and was hostile to visitors. He was also said to be wild and violent. Another report says that he owned the service facilities in the town and that was the reason for using his name. 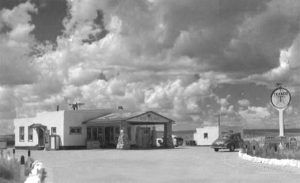 In any case, Two Guns became one of many tourist stops along Route 66 with a gas station, overnight accommodations, a cafe, and a souvenir shop for the many travelers of the Mother Road. Later a “zoo” was added to the popular tourist stop which included mountain lions, panthers, and bobcats. Their “cages” were huge kiln-like structures of brick, mortar and chicken wire, built along the rim and north wall of the canyon. After I-40 bypassed Two Guns, it like so many other popular Route 66 stops, died a quick death. Although numerous resuscitations have been attempted for Two Guns, it still sits lonely and abandoned today. Vintage photo of Two Guns filling station. At the site are the remains of the old bridge that crossed Canyon Diablo when it was part of the National Trail and Route 66. The ruins of the old zoo can still be seen, as well as several abandoned buildings. Two Guns is just off of I-40 at exit 230 between Flagstaff, and Meteor City. After exiting, turn left, cross I-40 towards the site. 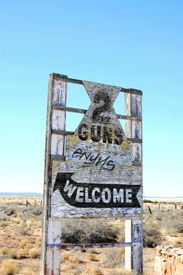 Also check out Two Guns’ sister city — Canyon Diablo. Two Guns Kamp today, photo by Kathy Weiser-Alexander, February, 2015. Mountain Lions were part of the zoo to attract visitors at Two Guns, Dave Alexander, February, 2015.